I love patterns and shapes, inherent in nature as well as manipulated. 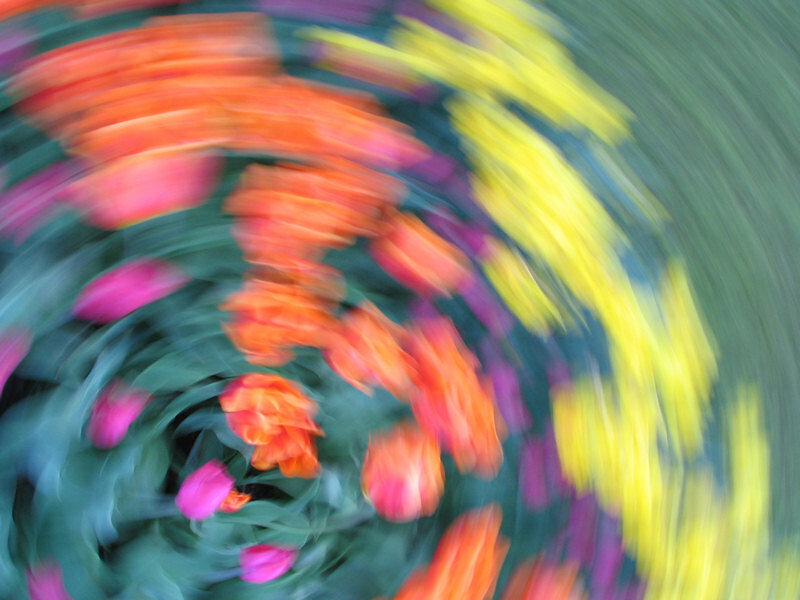 A favorite manipulation is to spin the camera at a slow shutter speed when photographing flowers, specifically brightly colored flowers like tulips, creating fascinating whirls of light and color. In this series, I was working with tulips from La Conner, Washington, and the annual International Tulip Festival, a rainbow resource of color and light. To create the spin effect, there are several methods. Let’s start with the equipment options. The perfect spin comes from a tripod collar mounted around a camera lens. This puts the spinning axis at the center of the frame and gives a smooth, controlled spin as the camera body is free to move, and the film plane remains flat as it captures the image. The camera mounted on the tripod can’t replace the center focus of the tripod collar, but it will still work, putting the axis at the side or off the edge of the film. Place the camera either vertical or horizontal with the pan-tilt feature of the tripod head loose, set the exposure for a slow shutter speed, and with a smooth fluid motion, flip the camera over during the exposure from one side to the top or vise versa. If you don’t have a tripod or want some unusual effects, you can try the spin holding the camera. It works better with two hands for stability, but you can use one. Set the camera for a slow shutter speed, possibly using a two second shutter release time delay to press the shutter and then stabilize your hands on the camera for the movement. Twist or swing the camera around during the exposure. The more the film plane (back of the camera) stays parallel to the subject matter, the more there will be a clean arc of the subject across the film. The more the camera back tilts forward or backwards, the more “shake” will be tracked, which can create its own unique effect, causing more abstractions than simple blur effects. I’ve tried all kinds of motion with the camera, on and off the tripod, even swinging it around by its strap, so play around with a variety of movements to get the look and feel you want. The shutter speed must be slow enough to trace the image across the film in a blur. Experiment with shutter speeds from .5 to 2 seconds. 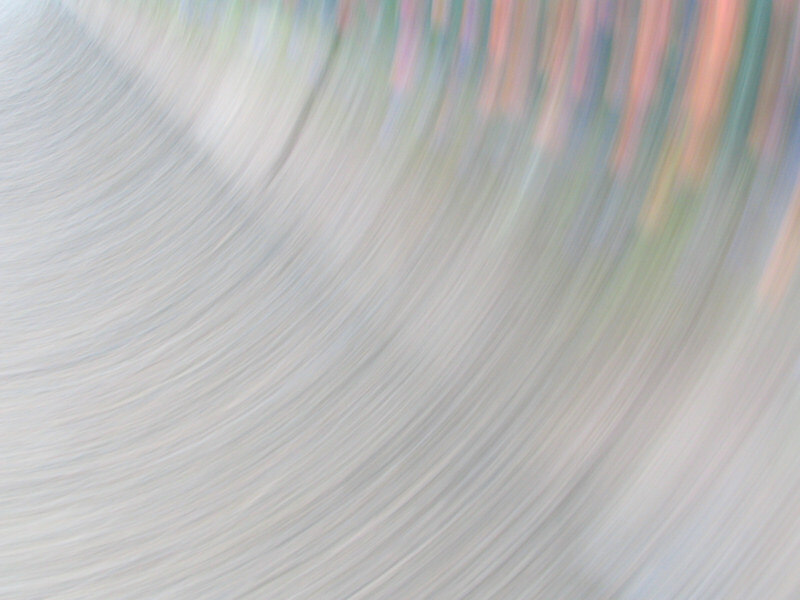 The longer the shutter is open, the longer the lines of the blur. The longer the blur, the thinner the lines and more abstract the image. The shorter the clur and shutter speed, the less agitation and motion in the image. If you can get your shutter speed to go longer in low light situations, experiment with that. If you are using a program driven camera, put it on shutter or speed priority and slow down the shutter speed as slow as possible while maintaining the correct exposure. Bracket the exposure to over or under expose the image to change the look and feel of the blurred colors. If you have a manually controlled exposure camera, do the same. Choose the slowest speed possible and set the aperture accordingly to maintain the balance of the light, then bracket from there. The brighter and lighter in tone the subject matter, the more likely the blur will produce intense colors. Bright lights, especially white flowers or sun spots, will create the strongest lines across the image. Darker tones and shadows, will leave dark lines. Personally, I love doing this with tulips as I get the strong colors which are accentuated against the green stems, which blur out into a neutral background. Take care with bright sunlight, sun spots, or white subjects in the image as they can overexpose and appear “hot” or washed out in the exposure, overwhelming the other colors and shapes. If you’ve ever done night or star photography, you’ve worked with controlling the “width” of the points of light on film by using a wide or small aperture. The same thing applies with blurred and spun images. The smaller the aperture, the finer the lines. The wider the aperture, the wider the lines. Experiment with different aperture settings to see how the line width changes with the same subject. What Can You Do With Spun Images? While spun images are great for pattern work and abstract art, and if you are really creative, could make fascinating puzzles, what else can you do with these? I like using them in my web and graphic design work as letter backgrounds. Bring the image into PhotoShop or whatever digital graphics program you favor. Add a layer of text in very bold, thick letters. Using a “magic wand” selector, select the blank areas around the text and the spaces inside the letters. Switch to the image layer and delete. This will remove the selected area, leaving only the letter areas in the photographic image. Remove or hide the text layer and see the letters “painted” with the blurred image. Add drop shadow effect and you have a powerful and unusual title text. I’ve seen some people combine these into note cards and photoquilts, the patterns becoming blocks in a digital quilt. There are many possibilities. 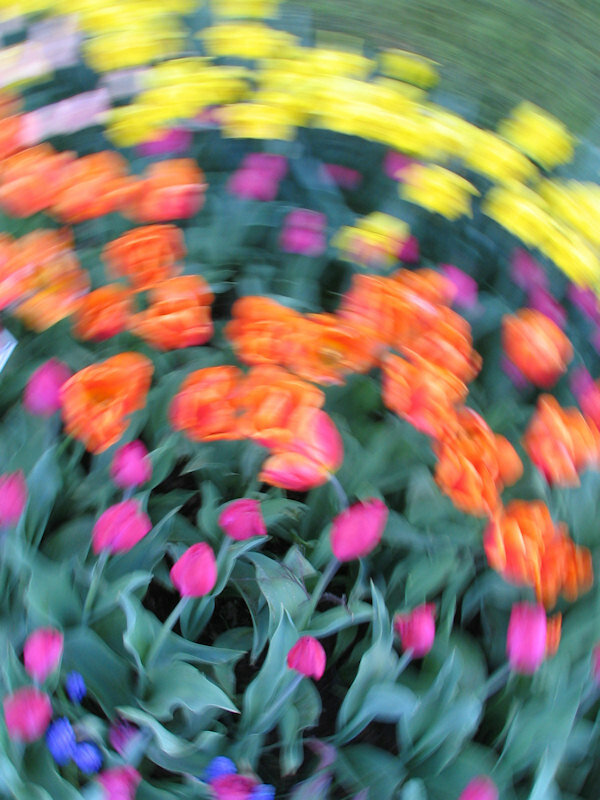 This article was posted in Basic Nature Photography, Photography and tagged flower spin, patterns, patterns in nature, photography, spin, spin images, spin photography, spun images, tulips, whirl. Bookmark the permalink. Follow comments with the RSS feed for this post.Post a Comment or leave a trackback: Trackback URL.